A couple of weeks ago, I wrote about God's provision. I told you there was more to the story. After a truly restful Sunday -- one where we stayed home from our normal Sunday routine due to the fact that Jacob woke up with a sinus infection -- I'm ready to share. But first, a bit about my Sunday... Mango and strawberries with granola and yogurt for breakfast. Yum. Then a loaf of bread prepared and set out to rise in the warm spring sunshine. A couple of loads of laundry washed and hung - I love the way the patio smells with laundry drying in the sun. Mid-morning our ayi came… While dusting, she commented on a little wooden figurine sitting on the TV, a "shelf elf" my uncle carved out of wood. I pointed to a small cross hanging on the other wall. "He made that, too," I said. "What does it mean?" she asked. I didn't know how to answer her question in Chinese, so I pulled my Chinese Book from the shelf and found the passage in Matthew that would give a better answer, and she sat down to read. Our Ipod cued the next song in the playlist… words about His resurrection came from the speakers. I smiled to myself, soaking in the poignancy and the sunshine, and whispered a prayer for those words she read to sink deep and take root. Later she asked if Jacob and I ever fight. I laughed and said of course… everyone disagrees at times. In my broken Chinese, I told her we do not go to sleep if we are still angry, for tomorrow the problem would grow bigger if we did. She smiled and nodded and said she'd thought we never disagreed. Despite our attempts to convince her that Jacob was fine, she called her son to bring Jacob medicine… "Take one tonight, and you will be all better," she promised. (He isn't, but she won't know.) And she made arrangements to cook lunch for us later this week, something she's wanted to do for a while. She spent most of her morning planning her menu in between tasks… Do you like jiaozi? What about ribs? She'd pepper me with questions in as she passed from room to room. She left and the bread baked. Grilled cheese for lunch. Preparation for a study on Ephesians we're starting in our small group this week… the assignment: read through the whole book and pick out the main themes. The word that stuck out to me? Prisoner. That, and "live a life of love." That's a part of scripture I identify more easily with… living a life of love. Being a prisoner is harder for my soul to understand. But I'm growing to love the nuances of my faith more and more. I fell asleep mid-book. (And it's a small book!) But Sundays are for napping. After I woke and finished my reading, I looked up recipes for dinner. Suprisingly, I had everything on hand for Spaghetti Carbonara. Yay! Something new. I put LeLe on her leash and walked to the village to buy some vegetables for a side dish. The dust storms have passed and Spring finally seems to be in the air. I think our sweet dog makes me more approachable. People seem unafraid to come and talk to me, as long as her leash is in my hand. Perhaps it's really her… pulling me towards her old friends, tale wagging with joy and anticipation of their attention. Everyone smiles and the conversation quickly turns from "What do you feed her?" to "Where are you from?" to "How do you use an oven?" One of the older couples has recently purchased one, and the old man is interested in learning to make bread. I try to describe the steps, but before long, I have an invitation to come to their home to teach them to make bread. They're so excited… I plan to go later this week. It's interesting how our cheerful pup has widened our community here. Dinner cooked, served, and dishes done. I'm rarely this Home Ec-ish and feel a sense of accomplishment with my domesticity. A few hours left before bed, and I sit down to tell you the other part of our story (albeit with what is now a rather long intro)… about our other community. You. The ones on the other side of this blog. If we were isolated and alone in this, we wouldn't still be here, and we're thankful for how God has used this little blog to build an incredible support network and community for us. Though some have told us we should link up with an agency or work under the leadership of church, one of the things that we most love about our "non-traditional" approach to this lifestyle is that we don't have one particular denomination or fellowship behind us. It's a bit odd to be thankful for that, I know, given that it might give us more security if we fit the traditional paradigm a bit more, and I know there is wisdom and good reasons for those models. But we feel so blessed to have supporters from all walks of life, denominations, and many corners of America… we think it reflects the Kingdom in a beautiful way. Some worship with their hands held high as a worship band leads them to the throne, while others kneel low and encounter the King to the soft cadences of a priest's prayers. But we all worship the same Father, and together we're working to build His Kingdom in this little village… We wouldn't have it any other way. There's a wee bit more to this post, but it doesn't really fit here tonight. So there will be a part three. I get it. This community. And a non traditional life abroad. What a privilege to follow along and learn from your experiences. I am grateful for your sharing. Thank you Carrie. Cannot wait for post #3. Love it....all different denominations...from different walks of life...around the globe...YOUR community! You know, community is something that I crave more and more of in this busy life. I am slowly building bridges to make this happen, but your posts reminds me that sometimes we find them in ways that surprise us. This week I will try to be more open to those sometimes random connections between me and my community (online or otherwise:). Thanks for your beautiful post! Such a cool post Carrie. I know that "we" that follow from blog world appreciate hearing your words and knowing that our God unites us for His purpose even from so far away. I always love peeking in on your world and savor the tidbits of Chinese culture that you tell us about as well as your walk to delve into Scripture and share it with us as well as those in China. It is so encouraging and inspiring and challenges me to not just accept a seemingly secure, passive lifestyle as being good enough. Can't wait for part 3.
mmmmm....your Sunday sounds delicious. Not just yummy delicious but the kind of delicious home feeling. Thank you for sharing the details of your day with us! And I read your post on sweet Joy below and can't wait to get an update on opened doors for her. I am praying for her...she is blessed to have you as a friend and advocate! 1. I agree with Tara . . . I sense a peace with God. 2. Ephesians always turns my attention to "adoption", as both your brothers are adopted. I read a theologian once who said God adopted groups . . . but Mom & I know it was not "groups" of sons we adopted, and are pouring our life into . . .
3. "if we fit the traditional paradigm a bit more,"
I love you daughter . . . more than you can know. Thanks for the encouraging word today about the Jordan Prison Chapel project!! I have been so behind in all things ... but today I caught up with you and wanted to wish you a beautiful resurrection Sunday from Waco, TX where we currently find ourselves attempting to be where God has us and also thankful for an on line community while we struggle and wrestle and wait to go home. You guys are walking the walk ... it is fun to be a small part of it by reading and following along. Mama to a lively girl. Wife to a selfless husband. Smitten with my sweet dog. Lover of orphans and justice and mercy. Trying to love others as I am loved. Moved to the West Texas desert after 4 years in the Chinese desert. (And I'm not particularly fond of deserts.) Though I've had a big world shift this last year, I'm learning to see His goodness right here and right now... even when it sometimes seems like nowhere. Our 'Lil Fair Trade Co.
Everything Nice - She's my sugar and spice. Born in the Year of the Dragon (Jan 2011) in Beijing, my little dumpling has turned my world upside down and taught me so much about the heart of God. All Our Children - All you could want to know about the children in our lives. Proof positive that New Day Foster Home has got the corner on cute. The Deep End - So deep you might need waders. See if you can make sense of my attempts to wax philosophical and share thoughts on our faith and our life. TIC (This is China) - Sometimes it feels like we live on another planet and not just in another country. Mostly we love it. Let's Talk About Us - Because what's a blog without a healthy dose of shameless narcissim? And I know how much you like listening to me talk about what I know best. 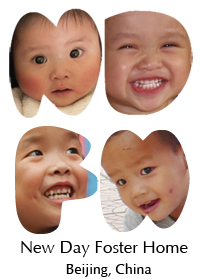 Hannah's Story - The story of a special little girl and the story of how we came to be in China... all rolled up into one. Etc. - The random posts that don't really belong elsewhere. Reading these will probably not be a very interesting use of your time.